Remember the movie ‘The Eternal Sunshine of the Spotless Mind‘ ? If have not seen that movie, let me give you gist of its story. Jim Carey and Kate Winslet find their relationship going sour, but due to their deep love for each other it hurts them too much. So they both opt for a selective memory erasure process, which is exactly what it is, so that they can completely remove any memory of each other from each other’s brains. The majority of the movie plays out in Jim’s mind as parts of his memory involving Kate Winslet get erased slowly. The film is mostly about love, despair and serendipity, but for our blog’s purpose focus on the memory erasing part of the story. Everyone remembers many of the bad things that have happened to them. Some are recent and a lot of them are in the past, dating back to one’s childhood and these troubling memories are brought to our attention by our brain often as we go about living our daily lives. Our failures and disappointments from the past have a way of coming right in front of us, often at some of the challenging moments of lour lives, if only to destroy our confidence or may be just guilt us into submission. Tragic events range from the common, like traumatic accident in childhood and heart-broken by a loved soul, to viciously debilitating ones like the trauma endured by returning soldiers and victims of violent crimes which can lead to PTSD. There is a valid and positive reason to get rid of these memories for one’s own physical and emotional well-being. The trouble with accessing a specific memory, never mind erasing it, is that its a tricky task. Memories are formed by physical bonds formed between neurons in our brain and, especially for long-term memories such as childhood trauma, are formed deep inside the brain and are much stronger due to repeated remembering of that event by the person over the years. This process where a recent memory becomes a strong long-term memory through repeated recounting is called consolidation. 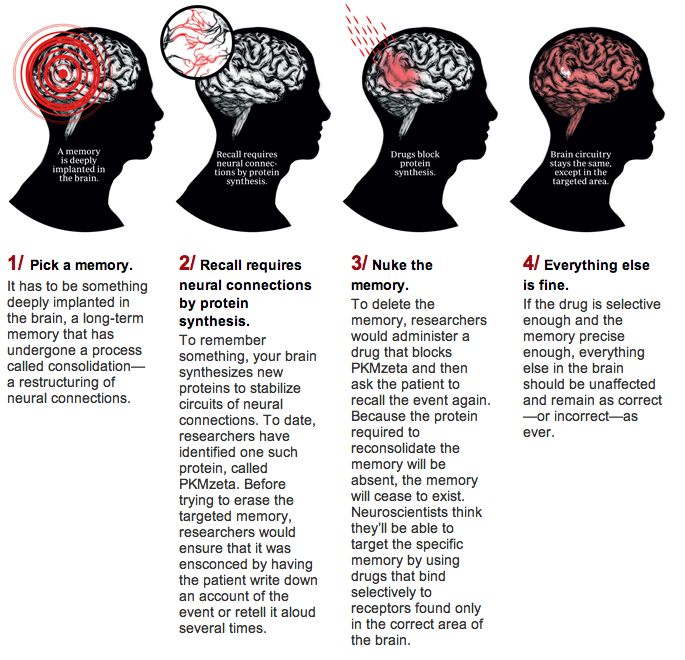 Consolidation makes targeting specific memories and removing them a tricky procedure. Well, not so much, anymore. What was a fictional technology in the movie I mentioned above, is a reality now thanks to molecular chemistry and a protein called PKMzeta. By managing the brain’s receptor for this protein which plays a major part in the neuron-bonding process which is crucial for forming new memories researchers were able to control and remove certain memories in lab setting . As this article from Wired magazines’s website points out, experimenting with this protein in rats has yielded favorable results for targeted memory erasure. The uses of this process, once improved and approved for public use, could be game changer in helping people with psychological issues. It could lead better treatment of PTSD sufferers in military and other professions where traumatic events are part of everyday routine. If we can put the moral and ethical objections to the side and focus on the science and the good this treatment can offer for those in need, we will be able to save many lives from what is currently a long, painful and often unsuccessful recovery process. Beyond those serious cases, I’m pretty sure the general public can come with a few things to remove from their collective past too, like the last two Matrix movies and everything about Snooki . Everyone has things they wish to forget. It’s about time they got their wish fulfilled.